Through a washing with water and the words of the minister, “I baptize you in the name of the Father, and of the Son, and of the Holy Spirit,” the baptized person is freed from original sin and personal sin. The Holy Spirit comes to dwell in the baptized person, making them a child of the Father and sibling of Jesus Christ. How great it is to be a part of the Family of God and a member of the Body of Christ! The necessity of Baptism is taught by Jesus himself, for he says, “No one can enter the Kingdom of God without being born of water and the Spirit” (John 3:5). Baptism imprints a spiritual mark on the soul, enabling the person to receive all other Sacraments and eventually enter Heaven. It is never too late to ask for Baptism! Parents should have their infants baptized in the faith of the parents as soon as possible after birth. And let’s not forget that God desires adults, who are not baptized, to enter into His family through Baptism. Click here for more information about adult Baptism (link Rite of Christian Initiation for Adults page). 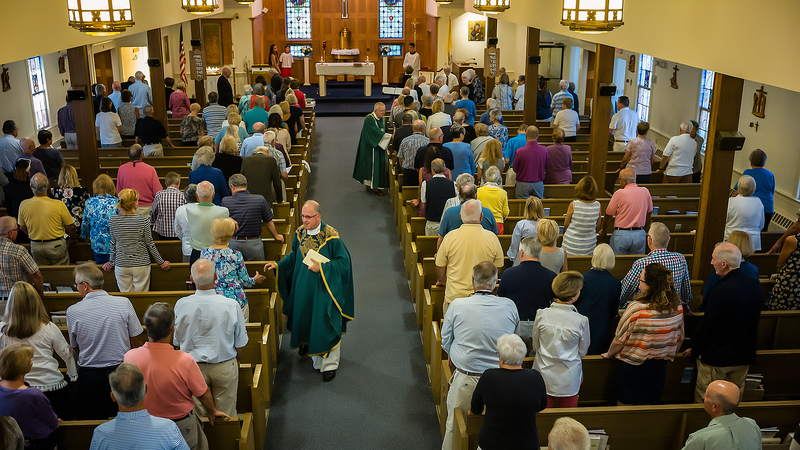 How do you arrange a Baptism at Holy Redeemer Parish? Welcoming a new member into the Body of Christ brings great joy to all the assembled and is an opportunity for all present to renew their faith. Therefore, Baptisms are celebrated the third Sunday of each month during any weekend Mass. All persons over the age of reason “7-years-old” who are not Baptized must enroll in the RCIA (Rite of Christian Initiation for Adults) program. Click here for more information.